A full-fledged military assault on a predominantly Muslim community typically sparks a global wave of protests, condemnation, and sometimes calls by Islamist leaders for retaliation. This has not happened, however, with Turkey's massive military assault on the northern Syrian border district called "Afrin." The operation, labeled by Turkey, "Olive Branch," was launched Jan. 17 on Turkish President Recep Tayyip Erdogan's orders to eradicate what he calls terrorists. Turkish air force bombings in Afrin have killed 142 Kurdish civilians and displaced 16,000 others. Turkey's state-run Anadalou News Agency claims that 1,141 terrorists are among the dead. That number includes members of the Kurdish Democratic Union Party (PYD) and the Kurdish Workers' Party (PKK), along with ISIS terrorists. The PYD and PKK are sworn enemies of ISIS. By lumping them together in casualty counts, the Turks hope to cast them all as threats. 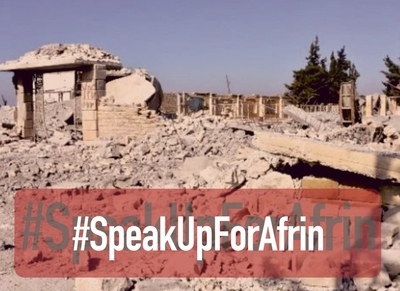 Afrin was among the few Syrian safe havens for civil war refugees. The Turkish bombing compounds the massive human catastrophe, as civilians are forced to flee the constant Turkish shelling. According to Kurdish TV sources, the Turkish army shelled an Afrin primary school and water plant, and shot fleeing civilians. Rev. Valentine Hanan of Afrin's Church of the Good Shepherd sent a plea to save the lives of the Christian minority as the pro-Erdogan Islamist militants were besieging the area and vowing to invade: "We as the Church seek the Lord's protection and then need aid and prayers from the brothers." These Islamists include ex-ISIS terrorists who joined Turkey's assault on Afrin, the Independent reported. 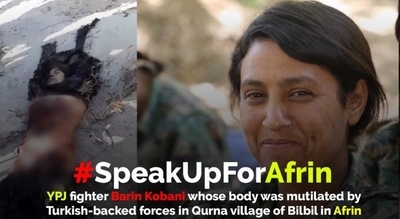 Videos show a female Kurd being savagely mutilated and killed by jihadists in Afrin. The victim, Barin Kobani, was a known hero who helped the U.S.-backed campaign to drive ISIS out of the city of Kobani. Turkey lost 30 soldiers in the assault, including 11 who were killed during weekend fighting and a helicopter crash. Another 115 Syrian troops reportedly were killed. Syrian Kurds protested in Afrin, shouting, "Down with mercenaries, down with Erdogan," while seeking more American support and action against Turkey. In the meantime, the Turkish government is riling up its citizens through patriotic and religious messaging. Pro-Erdogan Islamists say that Muslims in Mecca support the Turkish invasion of Syria and are praying for their victory. "With all our hearts, we support the campaign of Turkey – a glimmer of hope for the world of the oppressed to disrupt the game set up by foreign powers to put the country on the spot," the International Solidarity Association of Muslim Scholars said. In an appeal to patriotism, Turkish hardliner and pro-Erdogan writer Ibrahim Karagül blasted the United States as an enemy state because it "released the Kurdistan Workers' Party (PKK) and Daesh [ISIS] on us." America "is now the closest, greatest and most open threat for Turkey," Karagül wrote Jan. 26. "It is an enemy country. It is a serious threat to our country's existence, its unity, integrity, present and the future. It is carrying out an open attack, and an undeclared war against Turkey." He advocated ending the alliance with the United States and shutting down the NATO Incirlik Air Base. Inside Turkey, security officials detained 310 people earlier this month for "spreading terrorist propaganda" in social media posts criticizing the invasion of northern Syria. Detainees include politicians, journalists and activists. Turkey is providing refuge to Muslim Brotherhood members chased out of Egypt, and to other Islamists. Erdogan is keen on keeping Islamists as his allies, and allows them to attack the Egyptian government through an Istanbul-based television network. In return, Brotherhood leaders praise and support Erdogan. The Syrian Muslim Brotherhood supported the Turkish aggression against Kurds in Afrin in a Jan. 24 statement, in which they ironically quoted the reason for that support as a step towards the unification of the Syrian lands. They also mentioned that they support the Turkish state right to defend its national security, a right that they seem to exclusively grant the Turkish State. While the Brotherhood and other Islamists in the region support Erdogan's aggression, Islamists elsewhere in the world have had little to say despite the killing and possible violations of international law. Moreover, even mainstream Islamic institutions have not condemned the continuous attacks on Kurds by Erdogan's regime. The silence of Egypt's Al Azhar Institute, considered the most prominent Sunni academic center, remains baffling because it normally condemns any form of aggression against Muslims worldwide and calls for United Nations intervention in cases like the Bosnian war and the Rohyingya crisis. In contrast, Egypt's Ministry of Foreign Affairs issued a clear condemnation of operation "Olive Branch" as "a fresh attack on Syrian sovereignty." The condemnation stands alone among nations so far. The U.S. State Department has urged Turkey to limit its incursion and minimize civilian casualties. It seems the preservation of human life remains a selective matter for Islamists with their reactions are guided more by who they deem as the aggressor against Muslims. Apparently, even though a majority of Kurds are Muslims, Erdogan's invasion and killing of hundreds of Kurds and forcing thousands others to evacuate doesn't count.